Rooms, services Familienpension Sonnenhof Lackenhof is offering 14 tasfefully furnished, nice rooms for those looking for a place to stay at in Lackenhof. The pension has an own parking lot, enabling you to park your car on the spot for free. Internet connection is available, enabling you to stay up-to-date during your stay. An exact and detailed list of equipment in the rooms and of the services provided by Familienpension Sonnenhof Lackenhof you will find on the information sheet below and on the information sheet of the individual rooms, including any applicable additional fees. Catering Your reservation includes half board catering at the indicated room prices. Payment You may choose one of the following methods to pay your room: cash, bank transfer. Prior to finalizing your reservation Familienpension Sonnenhof Lackenhof requests 40% advance payment. Arrival, opening hours The earliest time for arrival and check-in is 16:00, the latest time for departure and check-out is 09:00. The personnel speaks German and Hungarian. 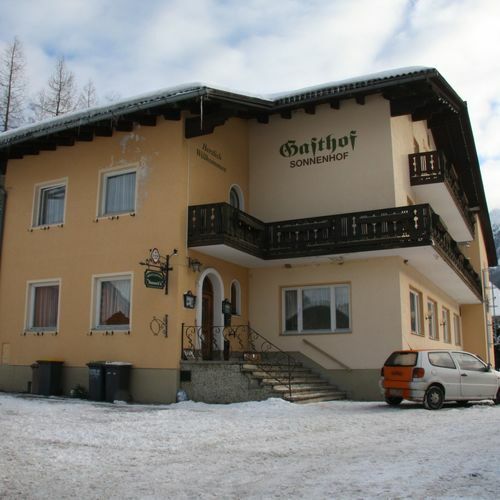 The rating of Familienpension Sonnenhof Lackenhof is 8 from the maximum 10, 5 based on actual and valid guest ratings and reviews.